downstream from Cumberland Falls, drains Eagle Creek, a tributary on the west bank. 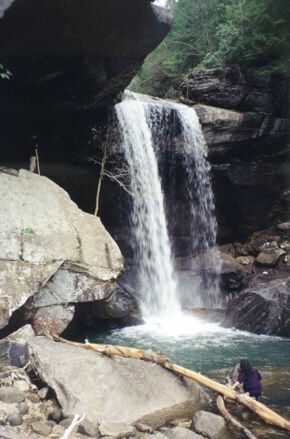 These falls were particularly sacred to the Shawnee Indians. Our time spent at this spot marks the northernmost point of our trip and a departure from the Sheltownee Trace. From here, we turned around and headed back toward the trails around the Big South Fork. Although we'd originally planned on going all the way to Natural Bridges State Park in Kentucky as we did in '95, a phenomenal number of trees were laying across the path. As Jim the Mad Professor said, "Hell, this ain't no fun!" A tornado the previous autumn as well as a blizzard which dropped 24 to 30 inches of wet, heavy snow on the branches of conifers February 3, 1998, had both taken their toll. Many roads were impassable and power was out for weeks. "Above all do not lose your desire to walk. Every day I walk myself into a state of well-being and walk away from every illness. I have walked myself into my best thoughts and know of no thought so burdensome that one cannot walk away from it." while Chödön (lower right) gets ready to wash her hair.